”All the bids were highly qualified and contained technologically relevant and exciting proposals for research and test activities at the test centres, and thus we apologize that we could not meet all the bids. This bodes well for the future and can help to ensure that Denmark will continue to be at the forefront at a global level in the research and development of wind technology”. The two new test stands at Østerild go to Siemens Gamesa Renewable Energy and Envision Energy. 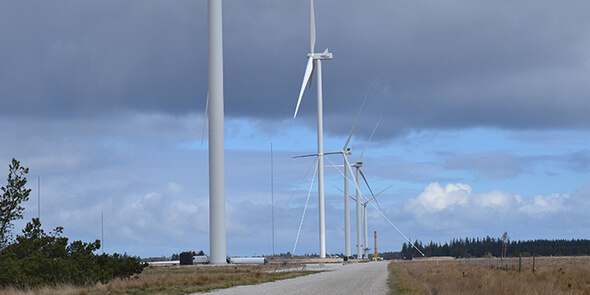 The two new test stands at Høvsøre have been awarded to GE Renewable Energy and Siemens Gamesa Renewable Energy. Vestas have won the tender for the existing test stand at Høvsøre. Concerning the expansion, DTU President Anders Bjarklev, says: ”DTU is proud that, with the completion of the tendering, we can deliver on Parliament’s decision earlier this year to expand the two test centres, Østerild and Høvsøre, so that testing and development of the latest technology in this area continues in Denmark, to the benefit of industry and Danish society”. The Minister for Industry, Business and Financial Affairs, Rasmus Jarlov also views the expansion positively: ”I am pleased that it is already known which companies have been awarded the new test stands so that the specific planning can start. It is all the parties in the Parliament that support the opportunity to expand the two test centres through more and larger test turbines in order to maintain the growth that the wind energy sector creates in Denmark, whilst at the same time strengthening the transition to green energy”.